Comments Off on Trail Cam Pictures!!!! 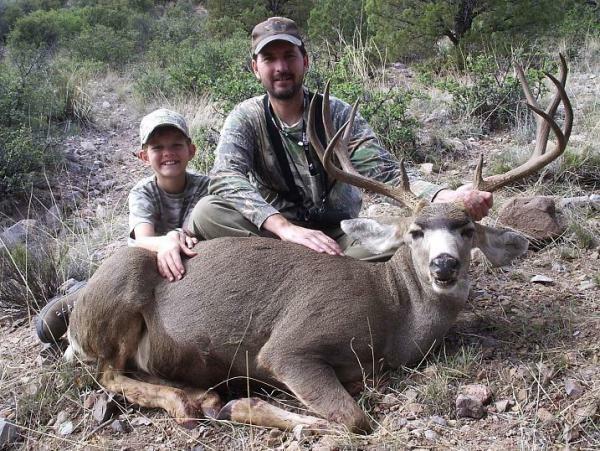 How about a nice little Coues Deer Buck? How about a floppy earned Mule deer doe? How about a highcountry STINK PIG??? 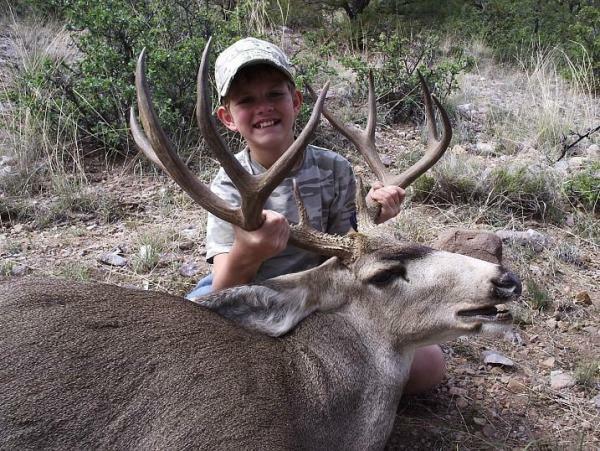 Tim and Kade’s Burro Buck… Great Job!!! 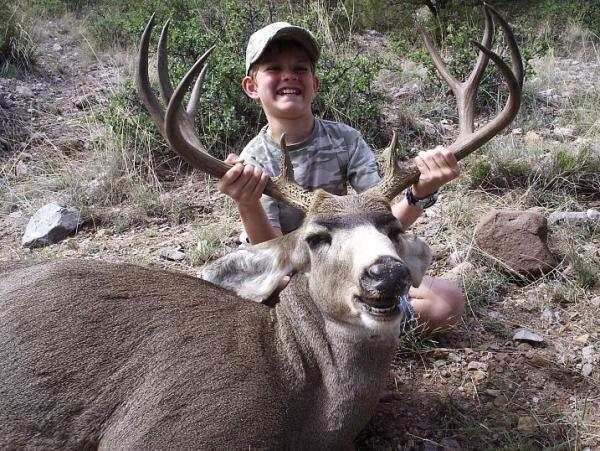 Comments Off on Tim and Kade’s Burro Buck… Great Job!!! Well we made it back! As you can see from Tommy’s posts we had a great hunt. I was able to take my nine year old son with me and I think everyone will agree from the smile on his face that he had a blast. The hunt itself didn’t take long. I used Tommy’s map service for the second time and he was dead on…. I mean that literally. Basicly Tommy sends his clients topo maps of the area that they will be hunting with areas flagged where he has seen deer. The area we were hunting was flagged in the exact spot where Tommy had seen a good buck last year. Our plan was to work down a ridgeline first thing in the morning that would allow us to glass finger ridges to our west and to the east in the area where the buck was spotted last year. 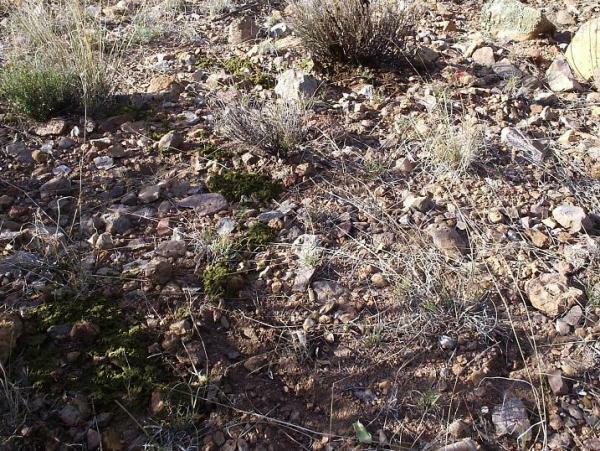 Not more than 15 minutes and about a quarter mile down the ridge I saw what I thought was a deer in the exact spot Tommy had marked on the map for us. Sure enough it was a buck and after putting the spotting scope on it I knew it was a great buck for the area. I lowered the scope for Kade to see and he immediately said… “that’s the biggest buck I’ve ever seen… we need to go shoot it!” So we did and this is our result. As I mentioned the hunt itself was short, but the tracking was long and difficult. I have to admit that I made a critical error in judgement when I took the shot. The only position we could find to give us a shooting lane was on a side hill and I was unable to get a level shooting position. In hind sight I should have found a better position, but we had already busted up some cattle and the deer was very alert. Not wanting to risk further detection and push the buck into nearby thick cover I took the shot from a very canted rifle position. This was a crucial mistake which resulted in a gut shot buck. So, since Kade’s hunting lesson was brief his tracking lesson would be long. When we got to the spot where the buck was standing when I shot this is what we saw. There was a trail of partly digested stomache matter instead of a blood trail. As luck would have it my good buddy Jason, who is part Swahili and skilled in the art of tracking, was only an hour away and was quickly on his way to give us a hand with the tracking. After a lot of painstaking effort to follow the pooh trail, tracks, and few drops of blood here and there we finally jumped the deer. He only ran a short distance before running out of gas and rested under a tree where I was able to put the finishing shot through his chest from a short distance. 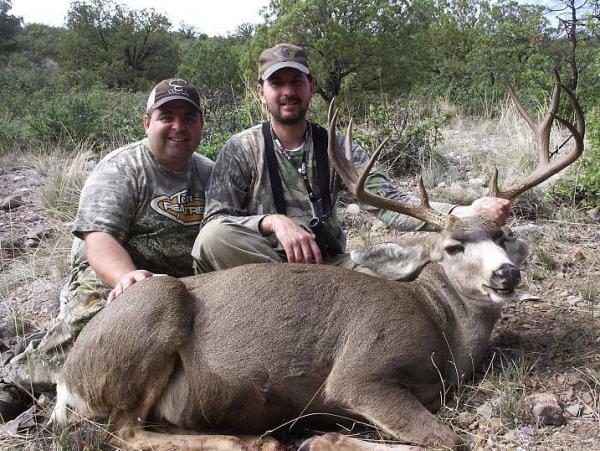 Picture of my Swahili tracker friend Jason and myslef with buck. 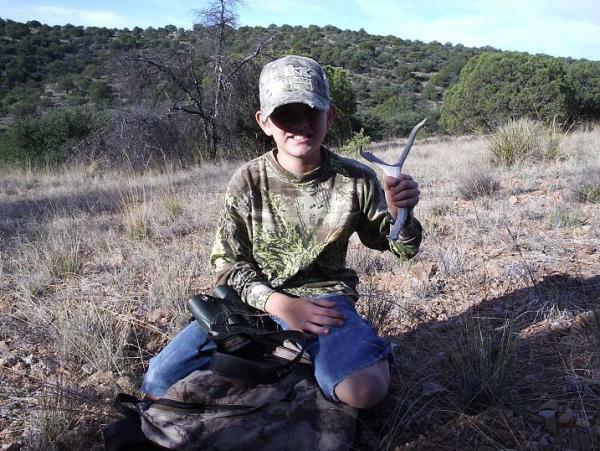 In the end all is well that ends well, and Kade and I had a great time spent hunting and trailing together. Thanks goes out to Tommy and Jason for all their help!!! New Fishing Rules at Blue Hole Pond! Comments Off on New Fishing Rules at Blue Hole Pond! SANTA ROSA — Blue Hole Park Pond in Santa Rosa is rapidly losing its water, prompting the Department of Game and Fish to issue an emergency salvage order to remove as many fish as possible before they go to waste. Today through 11:59 p.m. Oct. 24, all fishing regulations related to bag limits, tackle and angler age restrictions will be lifted at the lake. Anglers ages 12 and older are still required to have a license. Blue Hole Park Pond, a small body of water normally reserved for anglers younger than 11, developed a significant leak near the lake outlet, causing the lake level to fall significantly. The lake will be allowed to drain until repairs can be made. At that time, the lake will be restocked with game fish. The pond contains rainbow trout, largemouth bass, catfish and sunfish.